The Hotel has 23 delightfully decorated, individual bedrooms. 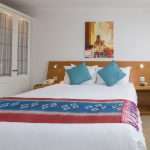 The large bedrooms are all en suite, with bath and overhead shower. Some even have corner baths and all are provided with our favourite brand of bathroom accessories. Each bedroom has been carefully designed to provide comfort during your stay in one of the most civilized hotels in St. Peter Port Guernsey. Our mattresses are changed regularly and are fitted with lush toppers and a choice of pillows to ease you into restful slumber! Each room has a large flatscreen TV, radio alarm, hairdryer, telephone and sumptuous beverage tray providing well for both business and leisure guests. Free WiFi internet access is available throughout the hotel public areas, by the swimming pool and in the bedrooms. For those visiting our hotel on longer stays or for a special occasion or anniversary, we have a variety of up market suites to cater for your all your needs. The Junior, Carlton and Garden Suites have all been individually furnished and decorated to the highest of standards. The decor in all our suites is smart and modern, with the accent on comfort with big sofas and flat screen televisions and wifi in both the lounge and bedroom. Excellent accommodation for the modern businessman or holiday guest. Our single bedrooms aren’t really standard at all! The single bedrooms all accommodate a standard double bed for your added comfort and plenty of room to stretch. All single bedrooms are en suite with beautifully decorated bathrooms, large bath/showers and our favourite selection of bathroom accessories. The rooms have large flat screen TVs, radio alarms, complimentary wifi, a choice of pillows and a beverage tray with a wide selection of teas, coffees and biscuits. Single visitors need never worry they won’t have plenty of room to move and relax in their own personalised single bedroom at La Collinette. The double and twin bedrooms are beautifully decorated and are en suite with spacious bathrooms, large bath/showers and our favourite selection of accessories. The bedrooms overlook the grounds and gardens of the hotel. All the bedrooms have flatscreen TVs, radio alarms, complimentary wifi, a choice of pillows, mattresses with thick toppers, and a beverage tray with a wide selection of teas, coffees and biscuits. The bedrooms can be adapted to provide either twin or double bed configuration. The Garden Suite is the latest addition to our portfolio of prestige accommodation. Overlooking the hotel pool and gardens, with views from the balcony across the island to the north of Guernsey, the accommodation comprises a large double bedroom with a luxurious jacuzzi bathroom and a large kitchen/diner/lounge. The Carlton Suite is our grand suite and is simply luxurious. Overlooking the garden, it is located on the first floor and has superb west and north facing views across the island. It has a beautifully appointed bathroom, a lovely kitchen (complete with dish washer) and a breakfast bar in the large well appointed lounge. Located on the ground floor the west facing suites feature a double bedroom and have been tailor made by design, having a small lounge area, a smart kitchen with microwave oven and hob, a dining table and a beautifully appointed bathroom, complete with a big shower head for a good drenching!